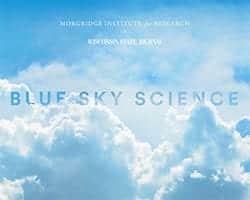 News & Stories > Blue Sky Science > Could scientists build a virtual brain and body for research? To learn from a virtual body, it would need to be able to accurately simulate or predict how the body responds to internal and external changes. What happens when a virus infects someone? What will their cells do, and how sick will it make them? Will a medicine be effective for a particular disease? Scientists would love to have a complete virtual body to study disease and treatments, but at the moment are not close to achieving it. Right now, building a computational simulation of just one single human cell is viewed as a major, but approachable, challenge. Constructing an entire virtual body to answer these types of questions is much harder. Humans have many types of cells and tissues. Your skin cells are different from your muscle cells and can respond to disease, medicine, and other stimuli in their own special way. Also, cells don’t work independently. They combine to form even more complex behaviors. Each person has their own DNA and environmental exposures. A virtual body would need to be customized to an individual, but researchers do not fully understand all of the connections between genetics, environment, and how a virtual body would respond. While it may sound hopeless, the good news is that computational biologists have made lot of progress modeling and making predictions on more focused, important biomedical questions. There have been extensive research efforts in personalized medicine, where doctors, likely with help from computers, would decide how to treat a patient based on predictions about how they will respond to different treatment options. Virtual models of cells or parts of cells can help scientists understand and predict fundamental aspects of how bodies work. Machine learning can be used to decide which biological experiments to conduct next to answer a research question, such as which chemicals may be good candidates as new drugs. Even though scientists can’t construct a virtual body today, computer models in the future may be able to serve some of the same purposes.